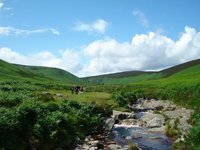 A walking holiday in County Wicklow, 'The Garden of Ireland'. 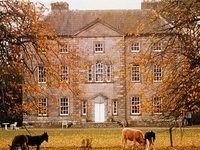 This 10-day tour includes 8 full days walking from Tinahely to Enniskerry and includes the very best of the Wicklow Way. Arrival to Bunclody from Dublin. Arrival to Dublin airport. AirLink bus to Busarus, central bus station in Dublin city. Bus Eireann regional service to Bunclody in north Co. Wexford. Bunclody is a pretty town on the banks of the river Slaney. Clonegal to Shillelagh. 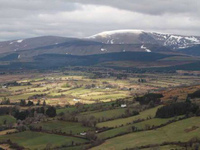 Your host will transfer you to Clonegal, the start of the Wicklow Way; walking is on country roads through Newry forest, Moilishe and Stookeen Hill, into the town land of Mungaculin. Your accommodation for the night will be in the 17th century village of Shillelagh origin of the Irish walking stick cut from the blackthorn tree, "The Shillelagh". Distance 23 km. Ascents 120m. Approximate walking time 6 hours. 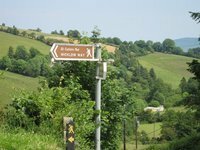 Walk Shillelagh to Moyne with optional climb of Ballycumber Hill. From Stranakelly, return to country roads past the market town of Tinahely on the banks of the river Derry which was destroyed in the 1798 rebellion, subsequently rebuilt and found a new lease of life with the coming of the railway in 1865. This section of the Wicklow Way takes in some fantastic views back over the area that you have passed through, and the adjacent counties of Carlow and Wexford; it also passes through an old Ring Fort or Fairy Fort. Distance 18km. Ascents 100m. Approximate walking time 5 hours. With Ballycumber Hill 20km. Ascents 400m. Appromimate walking time 6 hours. Walk Moyne to Drumgoff (Glenmalure). Good climbing today through the pine forests of the Ow Valley. Drumgoff at the head of the picturesque Glenmalure Valley, provides a refreshing end to the day at the old coaching inn, Glenmalure Lodge. The area is renowned for its rebels and heroes during the 16th and 18th century Irish uprisings. The optional route over Croaghanmoira climbs to 664m and affords glorious views of the Ow and Avonbeg river valleys. Distance 21km. Ascents 500m. Approximate walking time 6 hours. Optional route, Croaghanmoira Hill Ascents 850m, approx. walking time 6 hours. Free Day in Drumgoff to explore the Glenmalure Valley. The valley route takes you through pine forest initially for wonderful views of the deep gorge of the Avonbeg river on the eastern flank of Lugnaquilla, the highest point in the area. The descent follows Carrawaystick Brook as it drains the lough into the Avonbeg 450m below. Carriglineen is an easier route for a good walk coupled with some relaxation at the Lodge! 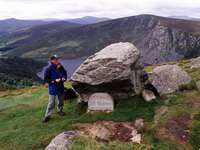 Ascents of Lugnaquilla are for the experienced hiker and would also start from Glenmalure. Carriglineen Mountain: 8.5km, ascents 330m, approx. walking time 3 hours. Glenmalure Valley: 12km, ascents 600m, approx. walking time 5 hours. Walk Drumgoff to Laragh with optional climb of Mullacor and Derrybawn Mountain.Superb views, superb walking, superb 6th century monastic remains at Glendalough; today is one of the tour's highlights. Climbing through forest from Drumgoff, the Way opens to the flat saddle of Mullacor at 550m before crossing open moorland to the slopes of Derrybawn Mountain. The first view of Glendalough (An Gleann Dhá Locha, the glen of the two lakes) is wonderful, deep wooded sides and the Glenalo River flowing through. From the valley, a short climb takes you northeast and then down the Glenmacnass Valley to Laragh village. Distance 18km. Ascents 530m. Approximate walking time 6 hours. 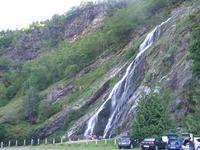 With optional climb 20km. Ascents 600m. Approximate walking time 7 hours. 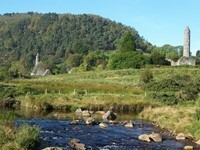 Free day in Laragh / Glendalough. There are plenty of options today; exploration of the monastic settlement in the valley, including seven churches, a gatehouse, a round tower and the St. Kevin's cell. Hiking options include the two suggested as well as a number of accessible routes, Derrybawn Mountain, Brockagh, the Glendassan Valley or Trooperstown Hill. The area is rich in heritage and history both ecclesiastical and political. Upper Lake and Mines: 16km. Ascents 540m. Approximate walking time 6 hours. Camaderry Hill: 20km. Ascents 580m. Approximate walking time 7 hours. Walk Laragh to Roundwood with optional Route via Scarr Mountain. 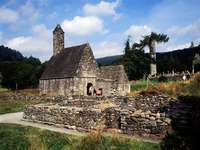 A short day allows time to visit the monastic remains and Visitor Centre at Glendalough. 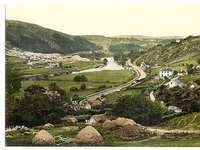 The valley was also home to extensive mining of lead, copper and zinc during the 19th century. The Way climbs the gentle flank of Paddock Hill, descending to Oldbridge, the Avonmore River and the beautiful Lough Dan. An optional route on Scarr Mountain offers wonderful views of this lake. Today's section finishes in Roundwood, Ireland's highest village at 238m. Distance 11km. Ascents 290m. Approximate walking time 3 hours. Via Scarr Mountain 15km. Ascents 520m. Approximate walking time 5 hours. Roundwood to Glencree /Enniskerry. Wonderful walking, overlooking Lough Tay, Lough Dan and Luggala Estate of the Guinness Family. A raised path covers a long stretch of open moorland to the saddle between White Hill and Djouce Mountain. From here it is possible to see the coast as far as Howth Head in north Co. Dublin. Descending past the 120m fall of Powerscourt Waterfall, enter the peace of the Glencree River Valley and a wonderful riverbank walk. Distance 18km. Ascents 250m. Approximate walking time 5 hours. Departure from Enniskerry by public transport to Dublin Airport. Public transport from Enniskerry to Dublin. AirLink coach to Dublin airport is available from various points in Dublin City Centre. It is possible to extend this itinerary to complete the Wicklow Way at Marlay Park in south Co. Dublin. Please do enquire if you are interested!